Olive’s mother is headed to jail and her brother to join the Army, so thirteen-year-old Olive is uprooted from sunny California and dumped in Washington state like a stray. That's exactly what she feels like surrounded by her aunt’s collection of homeless dogs, cats, and horses. Fourteen-year-old David’s future is already carved in stone. From a military family with two brothers serving overseas, he’s been pointed towards the Air Force Academy his entire life - but a rafting trip gone awry might ruin his chances. When I first started to write SIX DEGREES OF LOST, I had two characters floating around in my head, begging for their story to be told. One was Olive, a thirteen-year-old girl with no choices in life. With an absent dad, a mother sent to jail, and a brother in the army, Olive gets shipped off to Washington State to live with her aunt, who runs a foster home for homeless dogs, cats, and horses. David is a boy whose choices are already carved in stone, or that’s what it feels like. From a military family, he’s expected to apply to the Air Force Academy and serve his country like his brothers are doing, but David chafes at the expectations loaded on him. Because both of these characters seemed to demand equal billing, and because I wanted to push myself as a writer and try something new, I decided to let them each narrate alternate chapters. So SIX DEGREES OF LOST is told from two viewpoints, and although it was sometimes like a jigsaw puzzle trying to make all of the pieces come together in a single storyline, I’m pleased with how it turned out. But more surprising to me was how the relationship between the two characters, Olive and David, developed once I put them on the page. One of the most enjoyable things about being a “pantser” (a writer who writes by the seat of her pants,) is that sometimes the story unfolds in ways the author doesn’t even imagine. I had thought that Olive and David might meet, become friends, and have some adventures together, perhaps saving animals. But they decided to take things into their own hands (as teenagers often do) and went on an unexpected journey at the end of the book that was totally unplanned. I was just as surprised as the reader might be. For me, that’s one of the great joys of being a writer – seeing what your characters do once you set them free on the page. Linda Benson has written several young adult and middle grade books, including The Girl Who Remembered Horses, Finding Chance, The Horse Jar, and a brand new novel called Six Degrees of Lost. Her passion for nature and animals often finds its way into her writing. She lives in the Pacific Northwest with her husband and a variety of animals, and is hard at work on her next book. For more Six Degrees of Lost check out these sites! Thanks so much for hosting me on your blog! I really appreciate it. 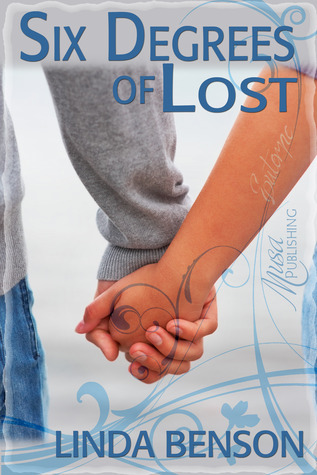 Just wanted to add that SIX DEGREES OF LOST is available as an eBook right now, and there's also a contest to win one of three promotional print copies on Goodreads that runs through July 26, 2012. So if you're on Goodreads, go check it out! Thanks so much for taking the time to talk with us! It was great! Hey Linda, nice guest post!Will tweet and share for you. Best wishes with this stellar tail...opps, I mean tale! Cheers! Sounds like a winner, Linda! Look forward to reading your newest book. Good luck with it!